If you're an extremely clumsy person, then having expensive items such as laptops and iPads can be a risky affair. The rugged G-Form Extreme Sleeve has been designed to keep laptops and tablets safe from knocks and bumps with its impressive casing made out of Poron XRD material. Rather than bulky solid cases that can be heavy, unwieldy and awkward to carry, the G-Form Extreme Sleeve is lightweight and flexible. It means that laptops or tablets are protected without the protection itself becoming a burden. The casing is far from attractive, but most importantly, it works. If you're taking your portable device to places where there is a danger it might get knocked about, then the G-Form Extreme Sleeve is a worthy investment. 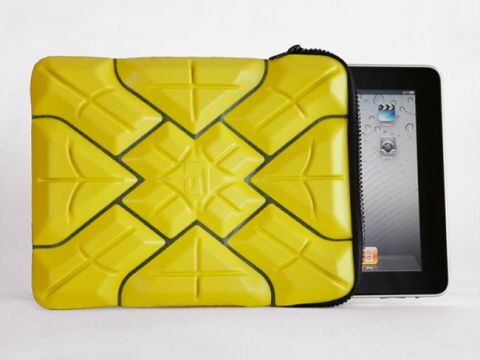 On its website, G-Form has a video example of a bowling ball being dropped on a G-Form Extreme Sleeve-clad iPad - and the iPad remaining unscathed. We had neither the bowling ball, nor spare iPad to test this out ourselves, but from our own tests we were very impressed with the G-Form Extreme Sleeve's resilience.